Tristan Wilder, self-made millionaire and devastatingly handsome CEO of Wilder-Nation is on the verge of a very lucrative buyout. With tough negotiations ahead, he’s armed with his acquisition pitch, ready to launch the deal of a lifetime. There’s just one glitch. The last thing he expects is to fall for the hot business owner he’s trying to sway. Dylan Reeves, computer science engineer and founder of the very successful social media site, Secret, is faced with a life-altering decision. A devoted family man with three kids and a wife, Dylan has been living a secret for years. Fiercely loyal to his convictions, his boundaries blur after meeting the striking owner of the corporation interested in acquiring his company. For the first time in his life, reckless desire consumes him when the gorgeous computer mogul makes an offer he can’t refuse. Thanks so much for the chance to read Secret, keeping my fingers crossed! Hot teasers! Nicely done. Thanks for hosting Kindle & Secret! Books by Kindle Alexander <3 Always a must read! 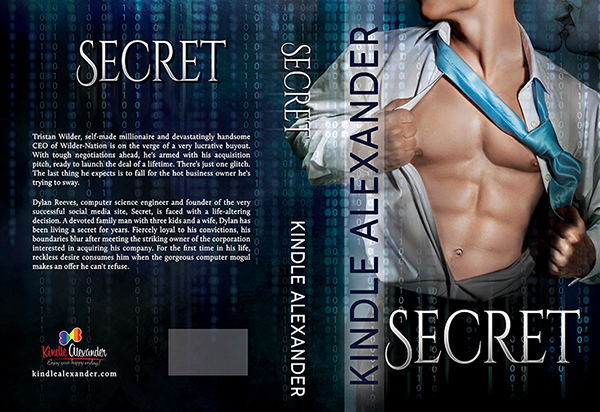 I haven’t read a Kindle book I didn’t love and Secret is no exception!!! SO HOT! Thanks!